Our good friend Mo from the Arctic Tundra (Denver) is here visiting for a week so we have been showing him the sun and sights of our little piece of paradise here in Fort Myers. On Thursday we headed over the $6 causeway to visit Sanibel, Ding Darling and the beautiful sandy beaches. 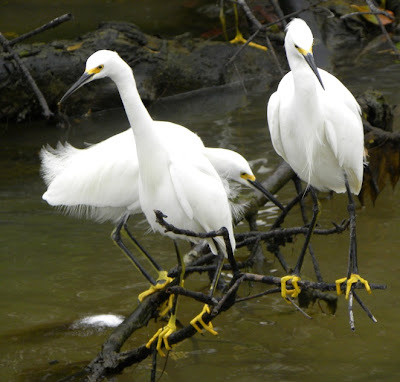 The most interesting thing we saw at Ding Darling was a Snowy Egret feeding frenzy. There were dozens of pairs of bright yellow feet flashing in the morning sunlight and jumping into the shallow water looking for small fish. An occasional Ibis and two or three Great Egrets joined them. Other than that, we didn't see anything special - a couple of Roseate Spoonbills way off in the distance - but not even one White Pelican. 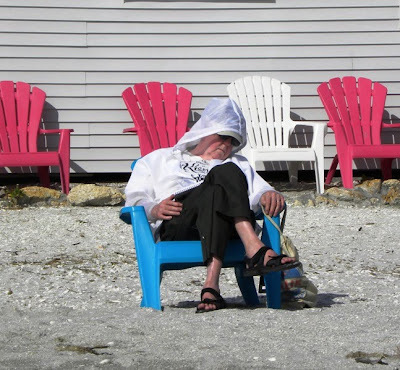 The earlier cold snap and hard freeze has had an effect on the Florida wildlife. The beaches of Sanibel are wonderful. We set up our chairs, sat in the sun, waded in the surf and took a long walk up the shell-laden beach. 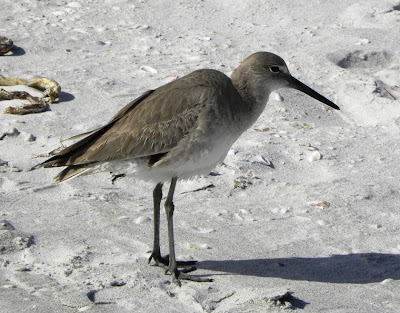 This Willet watched as we walked in the bright sun. 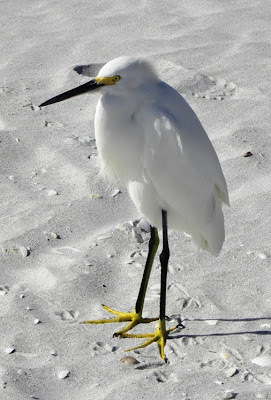 Even this Snowy Egret was enjoying the day. 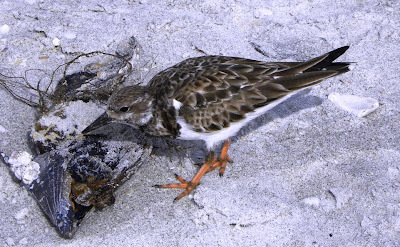 An industrious Ruddy Turnstone was busy turning over shells looking for any tasty morsels left behind. 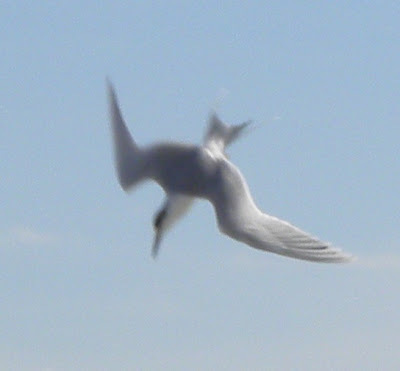 Bill worked for quite some time trying to get a good picture of this beautiful Roseate Turn as he flew back and forth over the water looking for small fish. When he spotted what looked like lunch, he dove into the water. 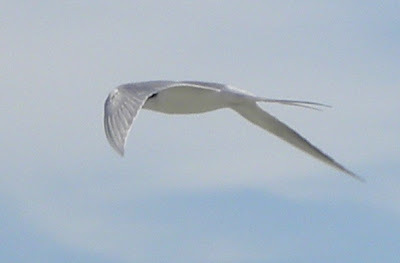 I wish we had a better picture showing his long forked tail and streaming feathers that were almost as long as his body. 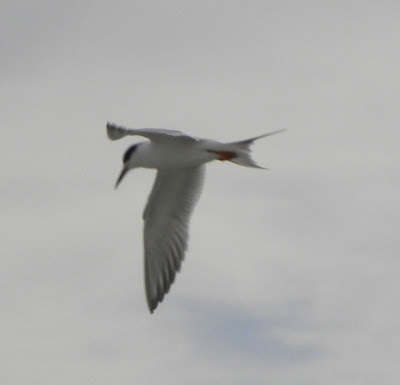 Roseate Terns are endangered in Canada and most of their range in the Northeast - but not here in Florida. 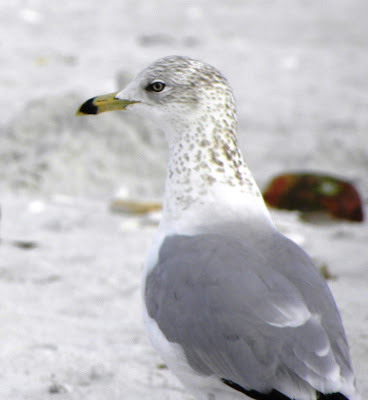 This shot leaves little question as to how the Ringed-bill Gull got his name. One would think it is easy to identify a gull when he poses so nicely - but I find it very difficult because of the different seasonal plumages. 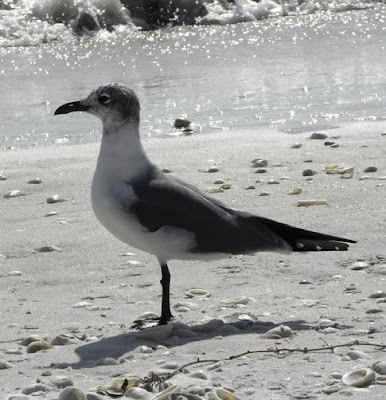 I've decided this is a Laughing Gull with his winter coat. In the summer, his head will be all black. 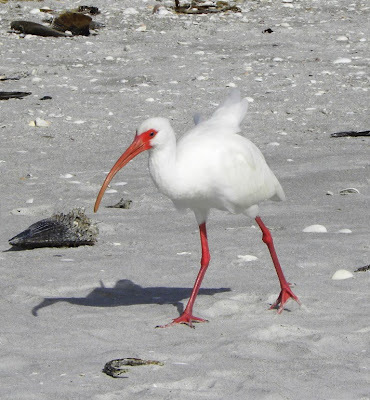 The White Ibis are just starting to show their breeding colors. His bill and legs will get bright red over the next couple of months. 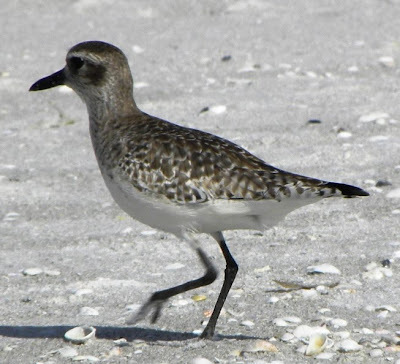 I had to check in all of my books to tentatively identify this bird as a Black-bellied Plover, again with his dull winter plumage. Usually birds of a feather flock together but this Sandal-toed Plover was all by herself - soaking up the warm sun and enjoying the day. We did too.